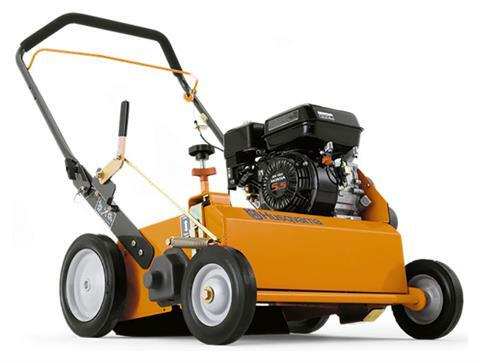 HUSQVARNA DETHATCHERS HELP YOUR LAWN BREATHE. With a modular design, the Husqvarna dethatchers offer incredible versatility and productivity. The rugged commercial construction provides the power and precision to get the job done right. The base platform can be combined with optional reels to offer versatility for every application. Standard flail blade reel efficiently removes matted thatch with centrifugal force. Other accessories include delta blades and spring tines. RUGGED COMMERCIAL CONSTRUCTION: Reel supported by heavy-duty, greasable bearings with cast iron housings and welded 10-gauge chassis with ball bearing supported wheels. ADJUSTABLE, ERGONOMIC HANDLE: Foam padded adjustable handle allows for three different operator heights as well as folding for easy transportation and storage. Handle mounted bail features an automatic safety declutching to stop blades. CENTRAL HEIGHT ADJUSTMENT: Easy to reach knob for quick and easy adjusting of blade height settings. STANDARD FLAIL BLADES: These free-swinging flail blades efficiently remove matted thatch with centrifugal force. This design provides excellent thatch removal and reliability proven over nearly four decades in the demanding rental equipment environment.